Acclaimed the best RPG of its time, Chrono Trigger was released back in the later days of the Super Nintendo. The game’s music has its own little story behind it, as a dissatisfied Sound Engineer appeared in the office of Hironobu Sakaguchi — who we know as the creator of Final Fantasy — and demanded that he must have a job as a composer, otherwise he would leave the company for good. His name: Yasunori Mitsuda. In return, he got the main role in composing for their next big hit, Chrono Trigger. Nobuo Uematsu played a reasonably small, but still credible role in the Original Sound Version, providing some of the more melodic themes. With the help of an arrangement by Nobuo Uematsu, Noriko Matsueda also made a small contribution, composing the “Boss Battle 1” track. Although this track was arranged, it led her to many new opportunities. Though Mitsuda played the main role, too many people forget the other composers’ efforts. The Chrono Trigger Original Sound Version is three CDs (64 tracks) long, and although one’s first criticisms would refer to the anachronous sound, it is doubtful that you will find much else to criticise. We are also presented with two unreleased tracks, which really, should have been put in the game, “Singing Mountain” and “Battle 2,” both of which are very creative, despite the former sharing similarities to the track “Laputa Theme” from the Anime production Laputa Castle in the Sky. 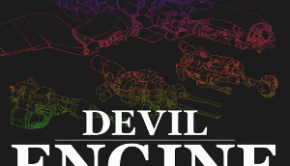 Immediately and evidently we can see that Yasunori Mitsuda wanted to get the feel of the game. He managed to produce many interesting tracks, thus bringing attention to the music rather than to the game. 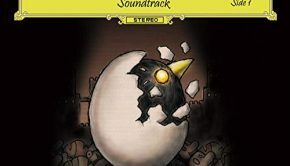 Throughout, we see him blending in some simple, light-hearted tunes (“Spekkio”), sad themes (“At the Bottom of Night”), upbeat tracks (Lucca and Robo’s themes), and darker themes (“Battle With Magus” and “Underwater Palace”). Not only this, but experimentation is also evidential, especially experimentation with the lesser used instruments. This is mostly evidential in tracks like “Schala’s Theme,” which turned out to be an unforgettable classic. The best thing is that the music always fits the mood in the game; “Battle with Magus,” for instance, definitely shows this. Mitsuda is a superb composer when it comes to light-hearted tracks. “Peaceful Days” — a track built on the idea of theme and variation — and “Guardia Millennial Fair” both have a real wow factor. The track “Guardia Millennial Fair” is Chrono Trigger‘s version of Final Fantasy VII‘s “Gold Saucer,” being very jolly and light-hearted, yet also being an example of a fusion of styles. Another such track is “Corridors of Time,” used in the Kingdom of Zeal. 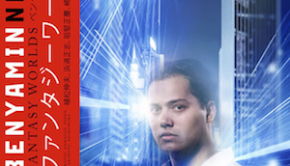 It sounds tragic, yet light-hearted at the same time, and Mitsuda utilises crazy cross-rhythms throughout to give it a unique touch. Similar to such tracks are those that have a hopeful sound. “The Day the World Revived” is a good example, being taken from the more positive section of “Lavos’ theme,” a theme used, strangely enough, for an evil parasite. “Ayla’s Theme” is another good track. Ayla, despite being primitive in nearly every way and extremely strong, also has style and this is expressed throughout this track. The track doesn’t fail her at all, so her true character shines through. “Epoch ~Wings that Cross Time” is the theme for the airship, and it is upbeat and catchy throughout. The introduction is great, and the melody makes the journey seem like an important one, being filled with hope and pride. Pride is another main aspect of the game, and it is mainly reflected in the character themes. 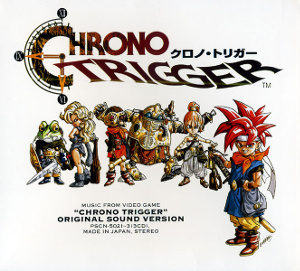 “Chrono Trigger” is the theme of the main character Crono. This catchy melody shows hope, pride, and enrichment, suggesting to us straight away that this person is an important character. This theme is manifested throughout the score, both directly and with remarkable subtlety. We then have “Kaeru’s Theme” (Frog’s theme), which is possibly the most memorable theme on the album. Kaeru was once a noble man, hence the glory of this track, but the evil and almighty Magus turned him into a Frog, thus this track is full of passion, representing Kaeru’s need for revenge. Both “Chrono and Marle ~ Far Off Promise” and “Robo’s Theme” work well in the game. They each show different aspects of success and glory, and this just shows how Mitsuda can create similar atmospheres in more than one way. “Guardia Castle ~Courage and Pride~” has to be the most obvious instance of pride shown through Mitsuda’s music. With trumpets and drums, what else do you need for a stately track? This track is very grandiose and has nationalistic influences, completely reflecting the style of Guardia Castle. This is certainly one of the better tracks on this album, and it is truly a marvel of its time. Mitsuda creates a wide range of mysterious tracks, too. “Secret of the Forest,” “Ruined World,” “Remains of Factory,” and “The Brink of Time” are great examples of this, each featuring disjunctive melodies and eerie bass lines to create this. “The Trial” and “The Hidden Truth” go hand-in-hand, both being played when Crono is taken to jail for doing nothing wrong. “The Trial” gives off the impression of the situation being a joke, but undergoes a metamorphosis to become more serious, whereas “The Hidden Truth” is played when Crono is brought to jail after the trial, utilising the same theme from “The Trial,” but on a piccolo. Both of these tracks certainly are effective at creating suspense and wonder. “Silent Light,” the first real dungeon theme, is played when you are searching for the missing queen. Nobuo Uematsu has gone to great lengths here, and it is his first input to the Sound Version. It has a very mysterious feel to it, and once again the odd bass line adds to this effect. The battle themes in Chrono Trigger are quite poor and it would seem like Mitsuda has a lot of trouble expressing the idea of pain, action, and adventure with such themes. There are exceptions, however. You really know you are in trouble when “Boss Battle 2” plays, as it is reserved for the hardest of battles. The upbeat tempo, trumpet melodies, and rhythmic drum beats are all key elements of a classic battle theme and Mitsuda uses them fantastically here. 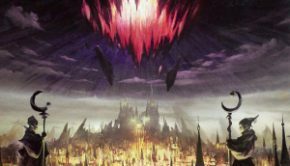 “Lavos’ Theme” uses similar principles, and is extended well to give “World Revolution” and “Last Battle,” the penultimate boss theme. The latter track is accompanied by frequent sound effects of crackles and pops, so you don’t even need to look at the screen to realise that Lavos, the evil alien parasite, is exploding, in classic SNES style! Final battle themes have never been Mitsuda’s strength, however, and the themes aren’t so good on a stand-alone basis. The other boss battle theme “Boss Battle 1” is Noriko Matsueda’s only input to the game, and it is a decent one at that, though it was arranged by Nobuo Uematsu. Matsueda certainly shows us here what she has learnt from the Front Mission Sound Version. Sadly, however, the normal battle music quickly grows repetitive and annoying, which is a pretty crucial flaw, considering one must hear this music hundreds of times in order to complete the game. The soundtrack finishes with three very well-mastered tracks. The first track is “Festival of Stars,” which representations our heroes celebrating. It’s a rather upbeat variation of “Guardia Millenial Fair” and a pleasant recapitulation of the theme. The next track, “Epilogue – To Good Friends,” recapitulates the classic melody from “Chrono and Marle ~ Far Off Promise” during the introduction. This develops at the 45 second mark, where it bursts into a rather gentle and lovely string arrangement, with a xylophone added in the background. The final track is the end credits theme, “To Far Away Times,” which is quite magical. The introduction is mainly a keyboard and a bass guitar keeping a steady beat. The melody begins to move above this, and as the game ends and the titles begin to flow, one cannot help but reminisce about everything achieved. Mitsuda’s last track of the Sound Version is remarkable in every respect; it’s yet another epic on a great album. Every Original Sound Version has its bad parts, and for this one, it is the second disc. “People Who Threw Away the Will to Live” gets tedious, and the regular battle theme is poor in comparison to others. However, apart from this, this is a great album in most respects. The album sees the birth of a new square composer, Yasunori Mitsuda, who used his past experiences in sound manipulation as guidance for the tracks. Hence he manages to create another great Sound Version for Square, and gives himself a better, more acclaimed role in Square’s productions. You can see from his quote, the pain and agony he went through to make the music work. It just shows what a dedicated and determined fellow he is! Since his career move to become a freelancer, Mitsuda has composed for a variety of recent games. However, perhaps with the exception of the Xenosaga Original Soundtrack, the Chrono Trigger Original Sound Version is probably the height of his career.